With World War II raging and his father fighting overseas in Europe, eleven-year-old Hobie Hanson is determined to do his part to help his family and his country, even if it means giving up his beloved German shepherd, Duke. Hoping to help end the war and bring his dad home faster, Hobie decides to donate Duke to Dogs for Defense, an organization that urges Americans to "loan" their pets to the military to act as sentries, mine sniffers, and patrol dogs. Hobie immediately regrets his decision and tries everything he can to get Duke back, even jeopardizing his friendship with the new boy at school. But when his father is taken prisoner by the Germans, Hobie realizes he must let Duke go and reach deep within himself to be brave. 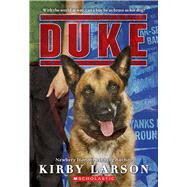 Will Hobie ever see Duke, or his father, again? Will life ever be the same? Kirby Larson is the acclaimed author of the 2007 Newbery Honor book HATTIE BIG SKY; its sequel, HATTIE EVER AFTER; THE FRIENDSHIP DOLL; DEAR AMERICA: THE FENCES BETWEEN US; and DUKE. She has also written a number of picture books, including the award-winning TWO BOBBIES: A TRUE STORY OF HURRICANE KATRINA, FRIENDSHIP, AND SURVIVAL and NUBS: THE TRUE STORY OF A MUTT, A MARINE & A MIRACLE. She lives in Washington with her husband.